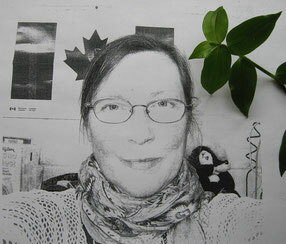 Kathy Figueroa is a freelance journalist, photographer, avid gardener... and poet. She resides in a rural area, perched on the edge of the wilderness, near the town of Bancroft, Ontario, Canada. On occasion, she writes about social issues and, to date, these poems have generally only appeared on the Internet. Included in this group of poems are, 'Blue (A Poem For The Blue Planet),' 'The Wind (December, 2009),' and, 'Memories Of Toronto (July, 2010).' 'Blue (A Poem For The Blue Planet),' appeared on the main page of the Barrie Examiner newspaper website, for several months, during a heated and controversial protest against a huge, proposed landfill development. The protest was, ultimately, successful and the landfill project didn't proceed. Several of her other poems became widely read and well-known when the editors of a large national newspaper posted her work online. Often employing an old-fashioned type of poem structure that was popular in ages past, her poetry spans a wide range of topics. She writes about subjects found in nature, ordinary events, and themes that people can easily relate to, as well as serious social issues, in a simple, clear, concise style that everyone can understand. Since 2006, Kathy has been one of the organizers of a monthly open mic event for local musicians, storytellers, and poets. She reads her work at these gatherings, as well as at a variety of other cultural events in the area. Kathy cites French poets and authors among her major influences.